Climb, then, into this paradise, this epicurism of pleasure, this pretty world of peace. 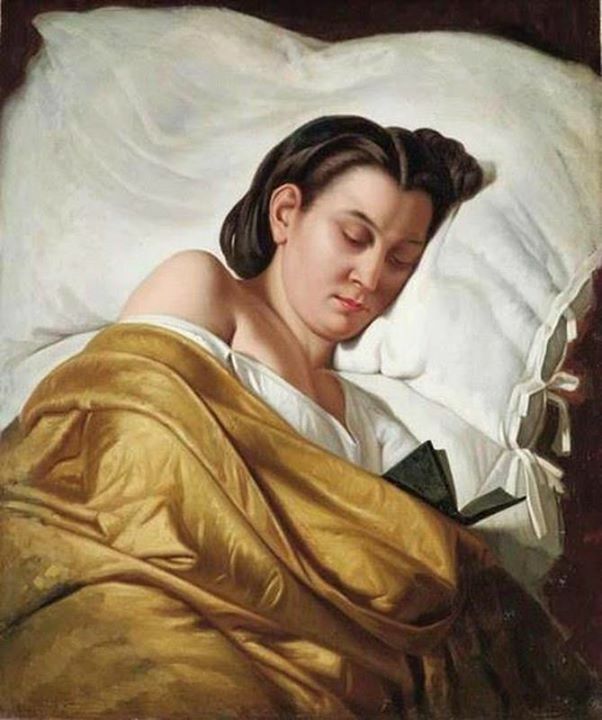 Push up the pillows, that they support the head at an angle as you lie sideways, your book held in one hand, its edge resting on the pillow. On the bed-head is a bright light canopied by an orange shade; it illustrates the page with soft radiance, so that it shines out of the environing shadows like a good deed in a naughty world. You are reading, I would suggest, a novel; preferably a novel which excites you by its story, lightly titillating, but not furrowing, the surface of the brain. Not poetry; not history; not essays; not voyages; not biography, archeology, dictionaries, nor that peculiar literature which publishers call belles-lettres. These are for daytime reading; they are not somnifacient; they stimulate the mind, the esthetic and appreciative faculties, the inventive imagination; in brief, they wake you up. You will never, I maintain, get to sleep on Shakespeare, Milton, or Marvell, or Hakluyt, or Boswell, or Montaigne, or Burton's Anatomy, or Sir Thomas Browne, or Herodotus, or any poetry or prose that fundamentally excites you by its beauty, or any work that imparts knowledge. These will light a hundred candles in your brain, startling it to vivid life. A story, and more particularly a story which you have not read before, will hold your attention gently on the page, leading it on from event to event, drowsily pleased to be involved in such fine adventures, which yet demand no thought. Let the story amuse, thrill, interest, delight, it matters not which; but let it not animate, stimulate or disturb, for sleep, that shy night-bird, must not be startled back as it hovers over you with drowsy wings, circling ever near and nearer, until its feathers brush your eyes, and the book dips suddenly in your hand. Lay it aside then; push out the light; the dark bed, like a gentle pool of water, receives you; you sink into its encompassing arms, floating down the wandering trail of a dream, as down some straying river that softly twists and slides through goblin lands, now dipping darkly into blind caves, now emerging, lit with the odd, phosphorescent light of oneiric reason, unsearchable and dark to waking eyes.